Megan and Zeb were married in an evening ceremony at the groom’s family home in rural New Washington, Indiana. The mother of the groom had transformed their already beautifully landscaped backyard into something that looked as if it came out of a fairy tale! 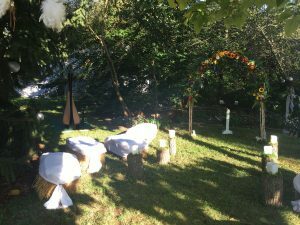 The guest seating was on hay bales, and the trees held dream catchers, balloons, and white feathers. The focal point was the floral ceremony arch. The whole space had a rustic bohemian vibe! 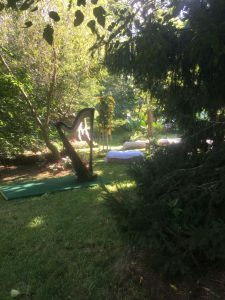 As guests arrived, the harp prelude included the piece “Great Day” by Nancy Gustavson, as well as some popular and country songs. The wedding party was the parents of the couple, plus their “Dog of Honor” and “Best Dog.” They came down the aisle to “Hornpipe in G” by Purcell. Megan chose the traditional “Bridal Chorus” by Wagner (“Here Comes the Bride“) for her processional. Between the vows and the exchange of rings, I played “All My Loving” by The Beatles as a harp solo. At the conclusion of the ceremony, Bach’s “Prelude in C” was the recessional. 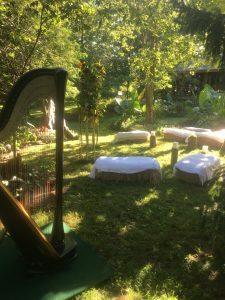 I continued with other classical and popular harp pieces as the guests headed off to the reception. But a few people, including the mother of the bride, stayed close by to listen to every note! In Louisville, Jeffersonville, or anywhere in Southern Indiana or Kentucky, I work with couples to create the perfect soundtrack for their wedding ceremony. It can be for large or small gatherings, at home or in a large ballroom, with traditional or contemporary music. Anything is possible with the harp! Visit my website ~ Southern Indiana Harpist ~ to get in touch! 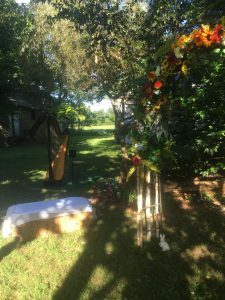 This entry was posted in Outdoor Wedding Ceremonies, Weddings and tagged at home, ceremony, new washington, penti, southern indiana, wedding. Bookmark the permalink.